This Future Positive New Year's celebration is brought to you by two amazing all volunteer non-profit groups that have been partnering for several years and are celebrating together. The Museum of Reclaimed Urban Space is celebrating its 6th anniversary. Time's Up environmental organization, which has made so many sustainable positive changes in NYC, is celebrating its 31st year. Check out their timeline 25th Anniversary timeline. 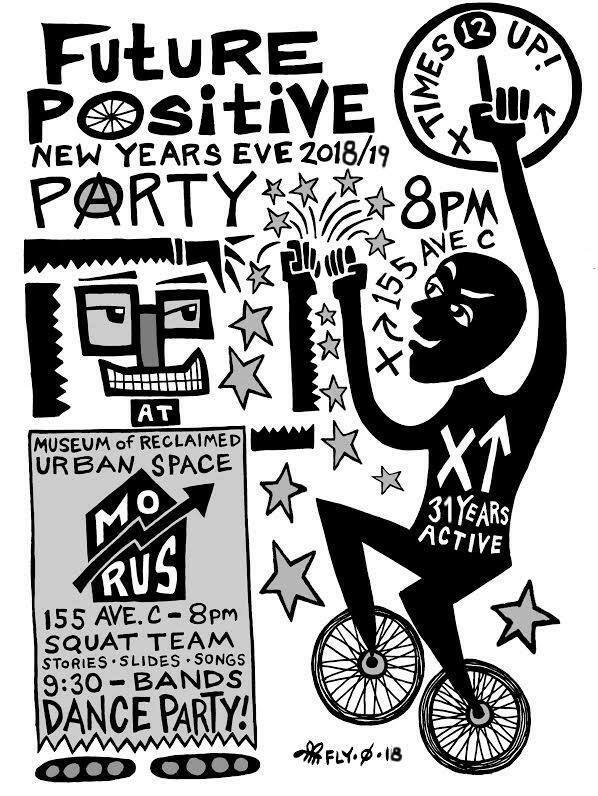 The New Year's Eve bash will be held at the museum in the legendary C-Squat, which is located at 155 Avenue C, LES, NYC. Multimedia presentations by East Village activist/artists including Fly, Seth Tobocman and Eric Drooker. Live music by Banji and the Rude Mechanical Orchestra. So put on your best dancing shoes and join us for this Future Positive start to 2019. Time's Up feeder bike rides are CANCELLED because of rain; just come to the party at MORUS! If you would like to help please let us know. Also please invite your friends and share this event! Sliding scale from $5 to $25 at the door.